Freezer meals are a go-to in our house for busy nights. I would often make a double batch of dinner and freeze the extras, but it takes a while to stock the freezer. A freezer meal exchange is a great way to get a variety of meals while only having to prep one recipe. I started a freezer meal exchange group over a year ago and I’ve found it so helpful I thought I would share some of the basics so you can start one of your own! 1. Seven women meet once a month. 2. We each pick one recipe, prepare the recipe times eight, and freeze it. 3. On the day of the exchange you leave one meal at home for your family and bring the other seven with you. At the exchange, the other six women get one of your meals, you collect your six meals, and there is one extra set of seven. 4. Each month our group selects a family to give the extra set to; oftentimes we divide it between two families. We all sign a card to the selected family and the person who nominated them delivers the meals. You definitely don’t have to include this extra set in your exchange, but I will say it has become one of my favorite parts about our group. We are all so busy between kids, home, work, church, and everything else that there’s rarely time left to do something nice for someone in need. This is a wonderful way to show someone you care and you’re already making seven meals anyway, why not make eight? I’ve learned by trial and error with my own freezer meal group, so I’ve compiled some of the things I wish I’d known before I started. Hopefully these suggestions will simplify the process of starting your own exchange group. – Do you want everyone present at the exchanges or are you ok with accommodating anyone who wants to participate but cannot be physically present for the exchange? For my group, I do require that anyone participating be physically present at the exchange. This is mostly due to restricted freezer space, but it also gets very confusing keeping track of duplicate sets of meals. I intentionally invited people to the exchange who had a similar family size so I could set a guideline that each meal should serve 4-6 people. We also have a general expectation that the meals should cost somewhere between $7-$9 each. If someone is feeling generous and decides to buy seven chuck roasts, that’s fine, but you don’t want anyone to feel obligated to spending more than the general limit. 2. Decide how many people you want in the group. This is important. You don’t want the group to be too large because the more meals you are prepping the more time and space you need. I’ve found seven to be a great number to start with, it’s not too much work for shopping and prep but it’s enough to have one week’s worth of meals each month. 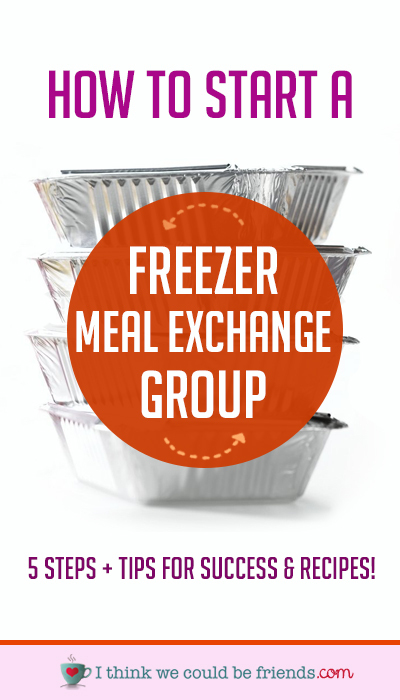 Start asking your friends if they are interested in a freezer meal exchange or if they know anyone who would be. This is a wonderful way to meet new people in your community, so don’t be afraid to spread the word. You can apply the first come, first served rule and if there are more people interested than spots available, start a sub list. A sub list is a great resource to have on hand when one of your original members is out of town, moving, having a baby, etc. I have found it works best to have a “core” group of participants who are willing to commit to a monthly get together versus trying to assemble a new group every month. You don’t need to have a contract or anything, but finding a sub for one or two people each month is way easier than finding seven. My group meets monthly but I have also been a part of a larger group (10 participants) who met bi-monthly. Once you’ve assembled your core group, figure out the schedule and also how you will communicate with them. I rely on group texts and a secret Facebook group. Over time some of our subs have gotten added to the Facebook group, so I send a group text to my core members to find out who is in each month. The seven of us (or however many can participate) decide on the date, time and location based on our schedules that month. Then, if we need subs, we post it in the Facebook group. We also use the group to share our recipes for each month creating easy access if you misplace the baking instructions. 5. Decide if you want a quick exchange or a social gathering. The format of the exchange is an important detail that should be decided upon ahead of time. You want to avoid making anyone feel awkward if they were expecting a quick swap and arrive to find everyone else is leisurely sipping coffee. My core group generally decides this at the time we pick the date. We have done quick exchanges where everyone brings their meals, we divide them up, reload our coolers and are out the door within 20 minutes. We have also done ladies only exchanges where we meet in the morning and enjoy coffee and treats. Last but not least, my personal favorite, we have done several family dinners. Everyone brings their family, we do a potluck style meal, and at the end of the evening the ladies quick sneak away and exchange the meals. Most of our exchanges have been at someone’s home, but I’ve also participated in groups who meet at a coffee shop or other outside venue so no one has to host. -Once you know who is participating in the exchange, send a list of names to everyone. The exchange itself will go much faster if the meals are labeled with everyone’s names. It’s a quick sort versus a guessing game. –Keep track of your favorites. If everyone loves your Beef Stroganoff, they won’t mind getting it again. –Be adventurous. One of the favorite meals in our group is Breakfast Burritos. You don’t have to make a dinner, just make sure it fits the other criteria (4-6 servings). -If you’ve never made the recipe before, try it before making everyone else’s. –Take advantage of the opportunity to buy in bulk. If you have a Sam’s Club or Costco membership this is a great way to utilize it. –Ask ahead of time if anyone has food allergies and let the rest of the group know. Looking for Freezer Meal recipes? If you are the facilitator of the group you will probably be doing introductions each time for new members or subs. Keep the group lighthearted and open so everyone feels comfortable sharing their successes and failures with their recipes. This type of an exchange is a great way to build community with people you might not know very well, so use it as an opportunity to encourage each other. The week’s worth of meals you will go home with is great, but oftentimes my favorite part is the conversation we have when we get together. Enjoy! My name is Caitlin Hogan and I blog over at HogansHaven.com. I started Hogan’s Haven last August because I love to write and wanted to share some of my family’s story. At the time my husband Zac and I had one son, Finn, who was ten months old. I was trying to find that ever-elusive work-life balance and was feeling totally overwhelmed with my new role as a mom. I didn’t know it at the time, but our story was about to get really interesting. We took Dave Ramsey’s Financial Peace University in January of 2014 and by December 2014 we had paid off just over $23,000 in credit card debt. 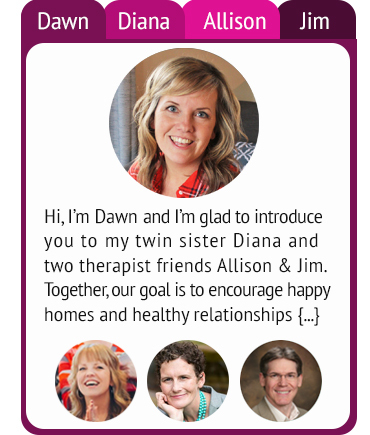 The blog was our way of sharing the ups and downs, ins and outs of our debt reduction with friends and family. Fast forward a few months and we are now expecting our second baby at the end of July. To make things even more exciting, we’ve decided to build a tiny house. Our income was going down with me cutting hours at work to be home with Finn more, but our expenses are constantly rising with our growing family. People have asked if we are doing this to be entirely debt free…kind of. We do want to be debt free, but we also want to experience a different type of lifestyle. One that requires us to practice restraint, humility and simplicity. Our goal is to live in the tiny house for two years starting this December once the tiny house is complete. During that time we will save up for our next house and hopefully be able to pay for most of it in cash. Sometimes I think we are crazy, and when reality hit this past weekend and we moved into our friend’s basement, I wanted to back out. It may not be easy, and it might not last a full two years, but God will be with us in all of it and we are trusting that He had this plan laid out for us long before it ever crossed our minds. Plus, even if it is completely awful, it will make for hilarious blog content. I look forward to sharing the journey with you. I have been wanting to start one of these! Pinned and I am sharing with my Facebook readers! Found you on Merry Mondays Blog Hop! Thank you for sharing and best wishes with your exchange group! Thanks LouAnn! Freezer meals are a wonderful thing!! Best wishes. Caitlin – this is a great post – thanks for all the tips for a successful freezer group. I’d love to have some meals ready to go in my freezer!